Darius the Great (c. 549 BC– 486/485 BC) was the son of Hystaspes and Shah of Iran from 522 BC to 485 BC. After Darius became Shah of Iran, he divided the Persian Empire into twenty provinces, and appointed a governor for each province. He introduced golden coins and developed commerce within the empire and trade without. Darius allowed Jews to rebuild the Temple of Solomon in Jerusalem. He also built many temples in Egypt. The largest building that was built by Darius, is the new capital of Persepolis, near Pasargadae. 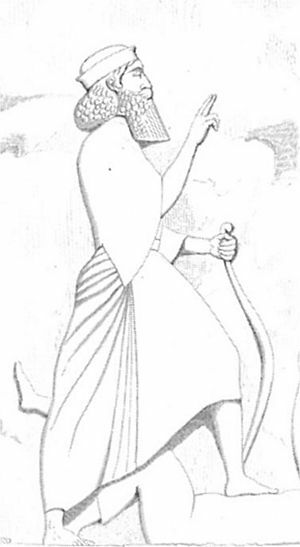 Darius died in Persepolis. His tomb was cut into a rock face near Persepolis. After his death, Xerxes became the Shah of Iran. Letter from Darius I to Gadatas, satrap in Ionia, about his management of a paradise (royal garden). Greek copy made during the Roman Era, found near Magnesia ad Mæandrum. The ruins of Persepolis. In the foreground is the treasure house, right behind the Palace of Darius. Darius I of Persia Facts for Kids. Kiddle Encyclopedia.